hanging in a charming drooping fashion. When the flower clusters open, dainty pale to medium pink flowers emerge and persist for several weeks. 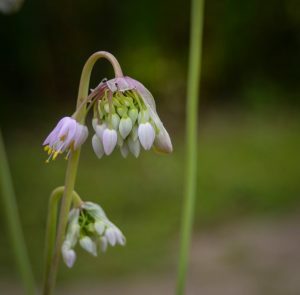 If the nodding wild onion is started from a seedling, they really come into their own in their second year, when their girth significantly increases. A nice trait is that they bloom in the latter part of the summer in to the early fall. Which is nice not only from a gardener’s perspective, but also from the perspective of the pollinators (such as our native sweat bees) who visit them. They supply a valuable later source of nectar. Nodding wild onion is a pretty easy going plant. It is happy growing in full sun to part shade and with dry to medium moisture. If your soil is on the heavy clay side, you should amend the planting area with some sand as they do appreciate good drainage. The stems can be used in cooking much in the same way as you would use chives, and the bulbs are also edible. They are easily propagated from seed which matures in the fall, or by splitting off the bulb-lets which develop at the side of the main bulb.